Goal setting and planning is your golden ticket to having everything you want and living the life you want to live. Considering that the alternative is to live a life that is heavily influenced by your environment and everyone else around you - it amazes me that so few people actually take the time to do proper goal planning. If you do not design your life someone else will design it for you. Do you think it's coincidence that almost 50% of the world's wealth is owned by 1% of the population or that only a handful of boxers work their way to the top of the boxing charts and win world championships? Is it just blind luck that enables a very small percentage of the world to live exciting, fulfilling lives full of experience while many others live a routine, drone-like existence? No matter who you look at - the vast majority of leaders and people you and I would consider successful such as world boxing champions, olympic athletes, CEOs, inventors, the wealthy - they all understand the importance of SMART goal planning and how it lays out a straight path to follow to whatever they decide they want. Can I ask you to take a minute right now and look at your life - not in a victim sort of pity party way - but objectively without the emotional baggage? Stop reading and take notice of where you are. Are you living the lifestyle you've always dreamed of or are you living and working to support someone else's dream lifestyle? On that note - do you even know what your dream lifestyle looks like? Next, let your mind ponder how you ended up where you are now. Think back through all those decisions and circumstances that had to happen in the order they did to lead to this moment. Now try and pick out the major decision points or events that put you on the path you're on - then ask yourself if it was you that controlled those decisions or were they events caused by someone else? You might be a little shocked to discover that you consciously only made 10% or fewer of the choices that led to your current situation - and that's likely because you haven't clearly defined what you actually want. Most people never do this or if they do - it is in a moment of complaint or despair. You can go your whole life stuck in a routine, rarely thinking and eventually accepting your lot in life as unchangeable, just doing what has become habit day after day, week after week, year after year until you drop dead. There's a saying that ignorance is bliss - but for those of you who think there might be more to life - I'd offer that SMART goal planning is the way to get there and I'm going to show you how to do SMART goal planning (with some added tweaks). Doing the work you want to do? Learning the things you want to learn? Are you spending your leisure time doing what you like to do? Do you even have any leisure time? Do you have the type of relationship you want? Do you have enough income to support your dream lifestyle? If you answered yes to all of that then great - stop reading and go live it, but I bet you are unsatisfied with at least one area of your life. So let's fix it. I have to reiterate the point though. Goal planning is critical to leading the life you want to live and not one imposed on you. I'd also like you to notice that I use the term goal planning instead of goal setting. It's one thing to set goals and another thing to figure out what you want, set goals, follow up with an action plan, commit and make yourself accountable. The entire process of defining what you want, setting the goal according to SMART principles, breaking it down into actionable steps, committing and holding yourself accountable is a complete planning process. Goal setting by itself is just one part of that process. Without goals, you are adrift in the ocean of life and it's easy to get blown around and off track. A lack of goals and direction is like knowing you want to be somewhere at noon, but you don't know where that somewhere is and you don't have a map helping you get there. How are you possibly going to get there on time (or at all) if you don't know where there is? As a boxing trainer and mentor I can help you achieve many things - but how am I going to guide you to where you want to go, if you can't tell me where it is you want to go? Am I supposed to guess? Because I will and I'll put you on the path that I think you should follow - and you may or may not like the destination - but the point is that if you aren't making those kinds of conscious choices about what your life should be like then you're letting other people do it for you. I don't believe that's the best way to go about living. I have a pretty good idea of where you need to go (according to Coach Aaron's view of what's important in life) and will get you to the right neighborhood, maybe even the right street, but eventually you're going to have to tell me the address. Make sense? I have a system built into Commando Boxing that enables my transformation clients to do SMART goal planning, outline the individual action steps (a checklist of sorts) to achieve them, and then share them with the world as a means of showing commitment and accountability. The system is simple and actionable and incorporates everything you are about to learn about SMART goal planning - so if you ever want an easy way to implement these principles to ensure you get what you want - become a client. 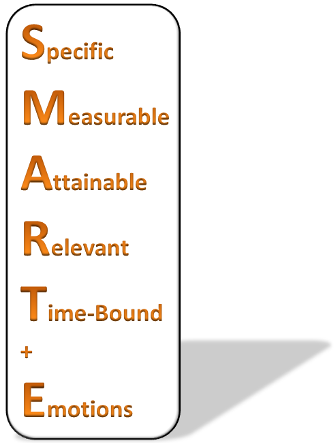 SMART goal planning has five principles that relate to each letter of the word SMART. I add a sixth - emotions. So goal planning according to Coach Aaron is SMART and Emotional or you can call it SMARTE. More than any of the coaching and mentoring I provide - this goal planning process is what allows people to achieve the results they do. That's because good goal planning ultimately leads to actions that move you closer to your goal. Goals built on SMART and emotional principles will motivate you to wake up and go for a run at 0500hrs in the morning or keep you from eating the big piece of cake sitting on your counter. ​If you showed up in my gym and told me your ultimate goal is to get in shape - I'd do my best not to roll my eyes at you. Those three words frustrate the hell out of me because 99% of people (my unqualified/unsupported assumption) walking into a club or gym show up with that goal in their head. When I ask Mr. X or Miss Y why they are there - they say to get in shape. It's crazy. What does that even mean exactly? Shaped like what - a goat? a car? I'm sure that Miss Y has some vague vision in her pretty little head of what get in shape means to her - usually resembling some actress or athlete - but she needs to be able to explain that vision in vivid detail or even present it in visual form. If she can't do that, her goal isn't specific enough. Writing down specific goals forces you to make the goal three dimensional, tangible, and real. Taking the time to cover the basic Ws: What, Why, Who, Where, and a little bit of How flushes that vision into something you can taste, feel, see, hear. The goal is no longer an abstract idea - it's a real destination. So when Miss Y tells me she wants to get in shape - I take a deep breathe, compose myself - and then I begin asking questions to try and draw out answers that turn "get in shape" into something like "I lost 5lbs of fat and built 3lbs of lean muscle mass by consistently following a boxing training plan in my home gym while eating to support my training so I can see my abs and feel confident in my bikini during my beach vacation in Cuba." A specific goal helps you see a detailed picture of the destination - the end-state of what you're trying to achieve. Your goals should have measures of effectiveness (MoE) built in to allow you to evaluate your progress at any time. Measures of Effectiveness (MoE) are rules you establish to see if you're moving toward or away from your goal. For example - if your goal is to make $100,000, your MoE could be any increase or decrease in your bank account. At any time you can look in your account and see if you are heading towards your goal (increase in the amount of money in your account) or moving away from your goal (decrease in the amount of money in your account). MoE allow you to make adjustments as you head towards your goal to ensure you're on as straight a path as possible. Without the means of evaluating where you are - you could find yourself weaving all over the road or taking wrong turns and delaying your arrival at your destination. Worse - you could be following a circular pattern that will never lead to your goal. That constant checking in to see how you are doing creates a feedback loop that is an essential component of goal planning. Not only will it get you what you want faster, but being able to see improvement (or catch disappointing results early), no matter how small, provides a bump in motivation to continue ahead full steam or make a necessary adjustment. Considering attainability injects a dose of reality into the planning process. Nobody can ever tell you what is attainable or not. It's a personal and objective assessment of whether or not you truly believe the goal is attainable or totally out of reach. But don't let your objectivity destroy your creativity. In other words - dare to dream big. Easily attainable goals are meaningless and boring and getting bored is a sure-fire way to remain unmotivated. The really big things that you really want will motivate you, so dream. Set giant goals that scare the crap out of you. You'll achieve 100% of what you aim at and if it isn't very much----well you get what you wish for. Use your imagination and surprise yourself - don't settle for mediocrity. Very few of us ever achieve our full potential. Big dreams are motivating and when you have a well written monumental goal, your subconscious mind simply starts looking for ways to make it happen. You'll see opportunities to move towards your goal in places you may have overlooked before. Alan Turing's vision of creating a machine that would eventually make the computer I'm typing this on possible was probably something that seemed completely unattainable to most people, but Turing believed he could do it. He believed it so much that by keeping it as his main focus - he turned that imagination into reality. So this principle of attainability is relative and relies heavily on your perception of your own capabilities. Truly believe you have the power to do the big things and you'll surprise yourself with the results. Let those big dreams excite, motivate, and scare the hell out of you because they help make life an interesting place to live in. Your goals have to mean something to you. There is no way you are going to motivate yourself to do something you have no interest in doing. How many people complain about going to work every day? Lots - because they find themselves locked into a job they hate working at to fulfill the goals of other people - goals that mean very little to them personally. Relevant goals matter to you so when you think you have a goal - run it through the relevance filter. Get introspective again and decide if that goal actually means something important to you. If it's not relevant you're going to have issues keeping it in focus and expending the necessary effort to see it through to completion. Every goal needs a deadline. Deadlines establish a sense of urgency that focuses efforts and available resources. Goals are seldom unattainable but the deadlines are so keep in mind that there are both short-term and long-term goals. Short-term goals are those you can achieve in the next 30-90 days. Anything longer than that is a long-term goal. Don't cram goals that are obviously going to take years into the short-term category and vice versa. Be sure to put some thought in to the actual mechanics of how long something may take to achieve. For someone walking into the club fat and sick - thinking you're going to transform your body into a world class specimen of health in four weeks is not realistic. Time is finite and you simply don't have enough hours in four weeks for your body to deal with years of neglect. This may seem contradictory to my advice to dream but it isn't - it's simply practical. There are physical laws that exist in the universe - the rules of the game. You have to play within the rules or figure out a way to bend them without breaking them. Do your best to ensure your goal evokes an emotional response. If you've read any books on habit forming, will power or motivation you've likely come across the analogy of the elephant and rider. The elephant represents your emotions and the rider represents your willpower. The rider can tell the elephant where to go some of the time, but when the rider gets tired or if the elephant wants to go in its own direction - it will - the rider isn't going to stop the elephant no matter how hard he or she tries. You'll only achieve the smallest of goals using sheer willpower. Willpower is finite and you run out of it everyday. Every morning you wake up with a full store of willpower and determination and every decision you make eats away at it until you have nothing left. It's precisely at that point when you are susceptible to outside influences - the cravings and the food commercials. That's when the elephant takes over and your emotions and desires completely rule the roost. The good news is that you can supercharge the goal planning process by linking positive or negative emotions to every goal. In essence you want to install a microchip in the elephant's brain that controls its focus so the rider doesn't have to do any work. Let emotions drive the process and the elephant will want to carry you to your goal. Picture yourself achieving your goals and really feeling it - sense the things you see, touch, hear, smell, taste in vivid detail and how those things affect you on an emotional level. Tie those positive emotions to goals you want to achieve and tie negative emotions to the consequences of actions that take you further away from your goals. Before I show you how to use the process you have to understand the rules of the game - the framework you're working in. If you do any type of research on the internet for proof that written goals result in a higher rate of success you'll come across the Harvard/Yale study. It's a great story that details a study that followed the careers of students - finding that only 3% of them had written goals and that those who wrote down their goals ended up with incomes that on average doubled those of their colleagues who didn't. That in itself should be motivation for writing down your goals - but the problem is that the story isn't true. There was no such study - it's just one of those myths that seems to perpetuate itself because it lends evidence to something most people who write down goals already know. It would be nice if that study had been conducted as it's simple and shows a concrete benefit of writing down your goals - it would make my job of convincing you to write down your goals that much easier. Combine that study with the anecdotal evidence I have and I'm totally confident enough to recommend written goals be your SOP (Standard Operating Procedure). Write down your goals and give yourself an advantage when it comes to following through and achieving them. You cannot achieve conflicting goals at the same time. If you have two goals that have to run over each other to get to where they need to be, you have to take one out of the equation until the other is completed. Focus on whichever is more important to you right now and then go for the other one later. For example, you probably want to lose X lbs of fat and you probably want to add X lbs of muscle at the same time. Those are usually conflicting goals. Losing fat is a process that requires a caloric deficit while building muscle uses a process that requires a caloric surplus. At the very basic level - you can't have a deficit and a surplus at the same time. The two simply are not compatible. There's another factor that goes along with this and it's along the lines of focusing on one thing. There's a book called Essentialism: The Disciplined Pursuit of Less that I recommend reading if you're having a hard time figuring out what you should focus on. It's all about directing your efforts to the one thing that matters at any given time and saying no to the rest. Worth the read. Write down your goals using the SMART and Emotional principles. Develop the checklist/plan to achieve each. The best way to show you how to use this planning process is to go through a complete example. This can be fun if you let it. Think about what you want. It can be anything and it doesn't have to be super specific at this point. Just a vague notion of something is fine. For this example the thing I want is - to learn how to box. You may want a whole lot of things and that's fine. Just write them down and then go through this planning process for each one. At the end you'll prioritize your wants and act on the number one goal on your list. Then you'll move onto number two and so on until you have everything you could possibly dream of. I can throw super fast, powerful boxing punches, execute instinctive boxing defenses, move like a boxer and am super conditioned allowing me to compete and win and have a boxer's physique as a result of consistently following a progressive boxing training plan from Commando Boxing at home and with my trainer in my local boxing club. If you look at that goal - you can see generalizations in it that you'll break down even further - things like "super conditioned". What exactly does that mean? You'll also dissect your goal based on the time it will take to complete. Long-term goals are really a sequence of short-term goals. Start with your ultimate goal. Then define the long term goals (milestones) that must be achieved on the road to the ultimate goal. Then break those down further into the short-term goals (milestones), the smaller goals, that you need to achieve to achieve the long term goals. I do truly believe I can develop the skills to compete and win. There is nothing about this goal that is unattainable. With enough effort and time everything about it is within my grasp. I've dreamed of competing in amateur boxing for as long as I can remember. In terms of what is important to me - this is number one. It does matter to me. I will win my first amateur match in 6 months. (More to follow on sub-goals below). I am so incredibly happy and satisfied that all the work in the gym payed off. Standing here next to the ref with my arm in the air validates everything I've been working towards at this moment. I feel proud of my accomplishment and feel the energy in the room as all the spectators clap for me in my moment of victory. The heavy medal hanging around my neck feels slightly cold against my skin but makes my heart swell with pride. I feel the relief of having made it through to this moment and am optimistic about what my boxing future holds. Writing down your goals and developing them according to SMART and Emotional principles does absolutely nothing for you if you never take any action. Just the act of completing step one and two is usually enough to motivate you to move onto step three and do something, but sometimes the goals you come up with need even more dissection to make each step a complete no-brainer. You continue to dissect your goal to the point where you have a massive list of super easy steps to follow and if you ever find one of the steps to be intimidating or daunting - you dissect it some more. For instance - I can take one of the steps - learn how to jab and break that down into its constituent parts. I may not know how to throw the jab, but if I know the jab consists of holding my arms a certain way, twisting at the hips, turning my fist over at the moment of impact - I can easily learn each aspect of that punch. Once I have each individual part mastered - I can start to reassemble them and soon enough I'm throwing a jab. Step complete. Depending on the complexity and ambitiousness of your goal you could dissect it into pages and pages of smaller individual steps. These steps become sub-goals of the main goal and you prioritize and assign a timeline to each just like with the main goal. This may seem like a lot of work - but I guarantee that the time you spend planning is well worth it. Even if you only get the 80% solution down on paper - that 80% forms your road map and action plan that will get you really really close to your destination. From there you can hunt around if you have to to finish it off. Now that you have your super awesome specific, measurable, attainable, relevant, time-bound and emotional goal and a detailed action plan that takes all the guesswork out of what you need to do, when, and in what order to achieve your goal - you're bound to succeed right? Not necessarily...because there still might be some inertia there that is keeping you from starting and maintaining focus along the way. So how do you get over that so you juggernaut your way to the finish line? The answer is by making your commitment real and then putting some accountability measures in place. This is most easily done by firing up your social media site of choice and posting a status update for all your friends and family to see that outlines the goal you're trying to achieve. End it with something like - "if you see me start to slide and put my goal on the back burner I really want you to call me out on it". You'll suddenly have an army of people either on your side supporting you with encouraging words when you need it or waiting for you to slip up. Either way - you'll find yourself wanting to keep on track to appease your supporters and not give all the people waiting for you to fail a reason to call you out. If you don't use social media - just tell your family or friends what you're trying to do and ask them to help keep you accountable. The Commando Boxing community is also here if you want like minded people to help keep you on track. There's no shortage of connections you can make now that everyone is connected all the time. At this point you have great goals and you're working towards achieving them and have people holding you accountable. There are three things you should do as often as you possibly can to ensure you remain focused. It's way too easy to get distracted and suddenly you'll be called out by one of your supporters or discover that days have passed and you haven't done anything to move closer to your goal. Getting and maintaining laser-like focus on your goal will make it happen a lot quicker. Make Daily Affirmations. Take your written goals and come up with affirmations that you can read at least first thing in the morning when you wake up and as the last thing you read/think about before going to sleep. You write these affirmations down on a card or somewhere convenient. They are personal, in the present tense, and positive and they represent how you feel having achieved your goal. For example - I am so thankful that my body is now 170lbs of lean muscle or I am so happy that I met the woman of my dreams. Use Repetition. Your subconscious mind is powerful and you program it with repetition. Read your affirmations at least twice a day and leave cues around that help keep your goal fresh in your mind as often as possible. Whenever you have a moment to day dream - day dream about achieving your goal. When you talk to someone - try and bring the conversation to your goal or relate it to your goal in some way. By doing this - you reinforce how important it is and your subconscious mind will pick up on opportunities and see things that you normally would not see that relate to your goal. If you don't believe me - test it yourself. Think about blue cars as often as you can over the next few hours/days and then notice how many blue cars you automatically see around you when you're driving down the road or going to the store. They may have been there before but they were filtered from your view. Now that you've told your subconscious that blue cars have some kind of importance - it will do its best to make you notice them. Your subconscious makes things happen - put it to work for you in achieving your goals. Cultivate Faith through Visualization. Along the lines of attainability - you have to really believe that you will achieve your goal - you need to have the faith that you can do it beyond all odds and negative thoughts you might have. Read your affirmations with conviction knowing they are inevitable. Visualize yourself as you read them as if they are already true. See yourself doing, feeling and acting the way you will when the goal has been achieved. And celebrate the small wins you make everytime your feedback loop says you've made some progress. It's a snowball effect and the closer you get to your goal with all the evidence and faith behind you backing up your conviction and keeping you on track - it's only a matter of time before you have everything you want. Congrats on making it through all that. If you're not totally overwhelmed at this point - then there might be hope for you to actually put this to good use. If you are overwhelmed I get it - I just dumped a crap load of information on you. I'd recommend going back to the top and really getting in to each section and then asking if you have any questions or if something isn't clear. The worst thing you can do is just give up and go read something else because this post truly is your ticket to live an amazing life. You have the opportunity right in front of you to put the universe to work for you and free yourself up to do whatever it is you want to do. Of course that starts with the decision that you are going to be in charge of your own life and some serious thought about what that life is going to look like. It won't always be easy and knowing all of this is not going to do much good if you can't control your own mind. Negativity and self-doubt will kill any progress towards a goal or dream you have really quick. In a future article I'll show you how to start thinking differently to make this whole process even more effective. It's exciting stuff - so stay tuned. For now - put some thought into what you want, master the SMART and Emotional goal planning process I've given you here, and, of course - Boxon.